Stunning four bedroom detached villa in the highly sought after Stewartfield area of East Kilbride. Set in a small cul-de-sac of only three other houses this fabulous family home is sure to impress all who view. The ground floor comprises hallway, large lounge with feature fireplace and fire and French doors leading to the rear garden. The modern kitchen has been re-fitted with a great range of floor standing and wall mounted units with granite worktops, breakfast bar, gas hob, built in oven and grill and there is access to the utility room. There is a good size dining room which leads into what was originally the integrated double garage. Although the garage doors remain at the front of the property, two rooms have been formed, one creating a fourth bedroom/playroom with a window to the rear and the other room remaining windowless and offering scope for further development. On the ground floor there is also reftted two piece wc. 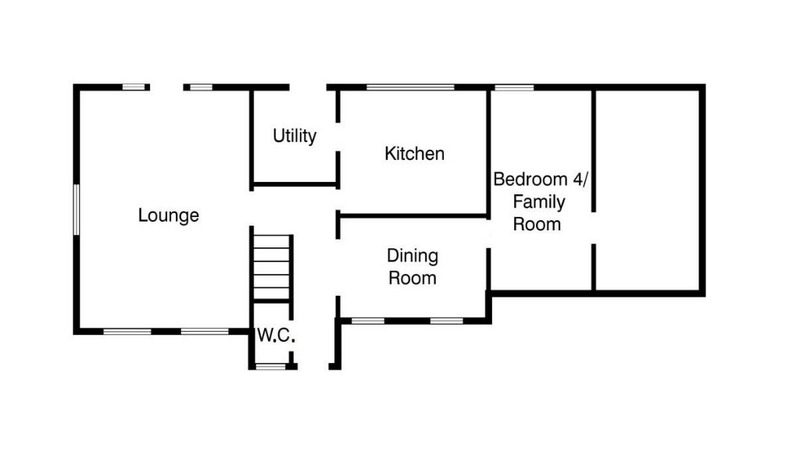 Upstairs there are two double bedrooms and a master suite comprising bedroom with archway to a dressing room and a good size reftted shower room. The property also features gas central heating, double glazing, driveway, garden to the front and great enclosed garden to the rear. East Kilbride Town Centre and Village area offer a comprehensive range of amenities which include excellent Supermarket and retail shopping, transport and recreational facilities. For the commuter East Kilbride enjoys a central locale with regular rail and bus services and motorway links in and around the Central Belt.